The budget bill, SB 99, was the landmark piece of legislation passed during the 2018 short session. The budget was an opportunity to address critical issues facing North Carolina, including GenX, teachers’ wages, and healthcare. Yet somehow, the General Assembly managed to find an avenue to put politics over people. The House and Senate leadership decided to utilize a rare procedural process to pass the budget, drafting it as a conference committee report attached to a preexisting bill. Conference committee reports do not allow members to offer any amendments, even to fix clerical errors. This process was highly irregular and contentious, as it shut the vast majority of the General Assembly out of the budget-making process, and excluded public input outright. The budget ultimately passed both chambers easily, surviving a veto by Governor Cooper. Despite publicly promising to deal with GenX, the budget allocated $12.2 million less to DEQ than did the governor’s proposed budget, hamstringing the agency’s ability to test for GenX and enforce the law. 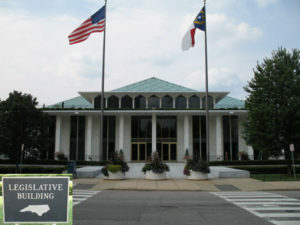 The budget also diverted significant research funds to the Policy Collaboratory at UNC-Chapel Hill, which the General Assembly created in 2016. The collaboratory does not possess the regulatory authority to require Chemours to clean up the Cape Fear River. This could set DEQ back significantly in its efforts to contain GenX and other contaminants, while citizens rightly worry about the safety of their drinking water. The toxicity of the budget process was fundamentally undemocratic. Coupled with a failure to prioritize our environment and public health, the General Assembly acted against the best interest of North Carolina’s citizens. Dating back to 2014, North Carolinians have filed 26 nuisance lawsuits against Murphy-Brown, a subsidiary of the world’s largest pork producer, Virginia-based Smithfield Foods, which is itself owned by a Chinese company, WH Group. Murphy-Brown’s waste management practices make living conditions unbearable for those who live near their factory farms, many of whom lived on their property long before the farms set up shop next door. In addition to attracting buzzards and flies, the foul odor from manure lagoons and spray fields pervade neighbors’ homes so strongly that some cannot even venture outside, many suffer ill health effects, and most see their property values decline. This summer, the General Assembly passed Senate Bill 711, the “NC Farm Act of 2018,” which put global hog corporations’ interests over constituents’ property rights. The Farm Act restricts citizens’ ability to file nuisance suits so tightly, they have become almost impossible to file. By stripping people of their right to take legal action, the General Assembly subjects rural North Carolinians to living in these unbearable conditions. Under the new law, nuisance suits can only be filed within a year of a farm operation being established, or if the operation undergoes a “fundamental change”—which does not include changes in ownership, technology, product, or size. Essentially, any hog farm that has operated with consistent waste management practices (no matter how dangerous) for over a year will become untouchable. Additionally, even if a case can be made to file a nuisance suit, punitive damages can only be recovered if the farm operator has been previously criminally convicted or has received a regulatory notice of violation of state farm laws, both of which are extremely rare. Rural North Carolinians are being forced to watch their health, quality of life, and property values diminish. As previously filed nuisance cases are finally reaching their long-awaited conclusions, it is evident that the courts are siding with the people of North Carolina over polluters’ profits. On April 28, 2018, one jury ruled that Murphy-Brown must pay $50 million to 10 families in Bladen County. In June, another couple was awarded $25 million. More recently, a jury awarded six plaintiffs a whopping $473.5 million in damages. Unfortunately, the compensation packages will be reduced to $3.25 million, $630,000, and $94 million, respectively, due to state law. Despite these verdicts, legislators continue to ridicule the lawsuits, dismissing them as “frivolous.” Proponents of the Farm Act falsely claim the bill is designed to protect small farmers. But Murphy-Brown, the corporation which owns the pigs, is the defendant in all the cases, not their contract farmers; the policies and practices under scrutiny are solely the responsibility of Murphy-Brown and its parent company. The General Assembly’s actions during the 2017-18 biennium revealed their true priorities regarding hog pollution—protecting powerful polluters’ profits instead of people. The General Assembly abdicated its responsibility to its constituents by kowtowing to big-money interests and not putting the people of North Carolina first.